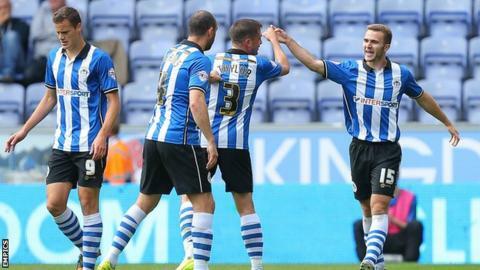 Winger Callum McManaman's first-half double helped Wigan to a comfortable Championship win against Birmingham. The hosts were 3-0 up by half-time, with McManaman netting first with a fine solo run and finish. Andrew Taylor fired in a second in off the post, and after McManaman scored again from 15 yards, sub Martyn Waghorn completed the victory from close range. James McArthur played the full 90 minutes for the Latics following the collapse of a £7m move to Leicester. The Scotland midfielder was instrumental throughout, providing the assist for Taylor's stunning second past Darren Randolph. After a slow start to the campaign, Uwe Rosler's Wigan have now won consecutive home games, while Lee Clark's Blues are yet to win away from home in the league this term. The home side dominated the contest from start to finish and could have won more convincingly as Oriol Riera, McArthur, McManaman and Waghorn all went close. Substitite Shaun Maloney set up Wigan's fourth goal shortly after coming off the bench, crossing for former Leicester man Waghorn to find the net from four yards, while defender Emmerson Boyce was denied a fifth by a flying save from Randolph. Birmingham were unable to find a consolation in the closing minutes, with Paul Caddis and Clayton Donaldson both denied by Wigan goalkeeper Scott Carson. Earlier, young defender Rob Kiernan had blocked a Caddis effort on the edge of the box and Donaldson headed straight at Carson. "It was a perfect follow-up from the Blackpool game - a mirror image. The one big difference was this time we made the goalkeeper work. We were clinical. "It was collectively a very strong performance, and it's nice to sign off for a two-week break with back-to-back wins. "We know we can score goals and we showed that today." "Everything's that's been good about us has been flipped on its head today. "The hard-working and powerful team that everyone has been talking about wasn't there. "The scoreline doesn't flatter Wigan at all. That was the difference between the two teams. It was like chalk and cheese. "We didn't stick to what we've been doing really well. All in all it was a really horrible day for us." Match ends, Wigan Athletic 4, Birmingham City 0. Second Half ends, Wigan Athletic 4, Birmingham City 0. Emyr Huws (Wigan Athletic) wins a free kick on the right wing. Foul by Demarai Gray (Birmingham City). Attempt missed. James McArthur (Wigan Athletic) right footed shot from outside the box is too high. Assisted by Shaun Maloney. Offside, Birmingham City. David Davis tries a through ball, but Clayton Donaldson is caught offside. Offside, Wigan Athletic. Andrew Taylor tries a through ball, but Martyn Waghorn is caught offside. Attempt saved. Clayton Donaldson (Birmingham City) right footed shot from the centre of the box is saved in the top left corner. Attempt saved. Paul Caddis (Birmingham City) right footed shot from outside the box is saved in the top centre of the goal. Assisted by Demarai Gray. Foul by Emyr Huws (Wigan Athletic). Corner, Wigan Athletic. Conceded by Darren Randolph. Attempt saved. Emmerson Boyce (Wigan Athletic) header from the left side of the box is saved in the bottom left corner. Assisted by Emyr Huws with a cross. Corner, Wigan Athletic. Conceded by David Edgar. Attempt missed. James McArthur (Wigan Athletic) right footed shot from the centre of the box is close, but misses to the right. Assisted by Shaun Maloney. Attempt missed. Mark Duffy (Birmingham City) right footed shot from outside the box is too high. Goal! Wigan Athletic 4, Birmingham City 0. Martyn Waghorn (Wigan Athletic) right footed shot from the centre of the box to the top right corner. Assisted by Shaun Maloney. Substitution, Wigan Athletic. Shaun Maloney replaces Callum McManaman. Don Cowie (Wigan Athletic) wins a free kick on the right wing. Attempt missed. Rob Kiernan (Wigan Athletic) header from the centre of the box is too high. Assisted by Emyr Huws with a cross following a set piece situation. Attempt saved. Martyn Waghorn (Wigan Athletic) right footed shot from outside the box is saved in the top right corner. Assisted by Emyr Huws. Substitution, Birmingham City. Demarai Gray replaces David Cotterill. Substitution, Wigan Athletic. Martyn Waghorn replaces Oriol Riera. Attempt missed. Emyr Huws (Wigan Athletic) left footed shot from outside the box is high and wide to the left. Assisted by James McArthur. Attempt blocked. Clayton Donaldson (Birmingham City) right footed shot from the right side of the box is blocked. Assisted by Jonathan Spector. Foul by Paul Robinson (Birmingham City). Scott Carson (Wigan Athletic) wins a free kick in the defensive half. Offside, Wigan Athletic. James Perch tries a through ball, but Oriol Riera is caught offside. Attempt missed. James McArthur (Wigan Athletic) right footed shot from long range on the left is high and wide to the right. Assisted by Andrew Taylor. Attempt saved. Don Cowie (Wigan Athletic) right footed shot from the left side of the box is saved in the top right corner. Assisted by Andrew Taylor. Emyr Huws (Wigan Athletic) wins a free kick in the defensive half.